FSU President Marlene Kim speaks to WGBH. Read the article or listen here. UMB budget and NTT cuts reported in the Boston Globe. UMB budget and NTT cuts reported in the Boston Herald. Board of Trustees delay vote on tuition/fee hikes, FSU VP John Hess comments, reported in the Boston Globe. FSU and UMB in Dig Boston op-ed opposing budget cuts and disinvestment from public higher education. FSU, CSU, and PSU members protest at the Board Of Trustees, A and F meeting; FSU member and activist Joe Ramsey is quoted in New Boston Post. FSU, CSU, and PSU members to protest at the Board Of Trustees' meeting; MTA spokesperson speaks on effects of NTT cuts, as reported on boston.com. FSU, CSU, and PSU members protest at the Board Of Trustees' meeting as reported on WGBH. FSU, CSU, and PSU members protest at the Board Of Trustees' meeting as reported on Fox 25. UMass budget cuts and disinvestment from public higher ed, FSU member Sara Bernardo and former FSU President Arthur MacEwan comments, as reported on WGBH. UMass budget cuts, disinvestment from public higher ed, opposition to proposed tuition hikes, and FSU member Joe Ramsey comments, as reported in the Boston Herald. Latest rounds of UMass budget cuts, with comments from FSU President, Marlene Kim and FSU VP, John Hess, as reported in the Boston Herald. Convocation protest covered in the Boston Globe. Lettter published in the Boston Globe from UMB union presidents concerning nature of UMB budget crisis. Barry Mills hired as Deputy Chancellor as reported in Inside Higher Education. Boston Globe article on UMB budget issues and increased cuts. 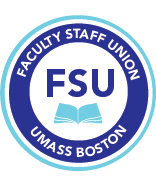 FSU members speak on impact of budget cuts in letters to the Boston Globe.